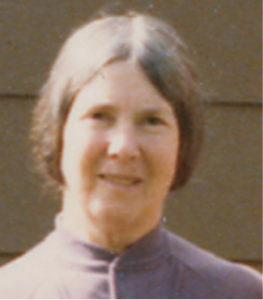 Marian Derby could be said to be the founding donor of the Los Altos center when she generously insisted that the garage of her home be converted into a zendo. Suzuki-roshi and the Sangha did the construction. There was room for seventeen cushions. As seventeen is the number of syllables in a haiku poem, they named the new center Haiku Zendo. Suzuki-roshi or Katagiri-roshi came from San Francisco each week to Haiku Zendo. Suzuki-roshi’s Wednesday night lectures were recorded. These recordings would become very significant a few years later, when they were transcribed and formed the heart of Zen Mind, Beginner’s Mind. 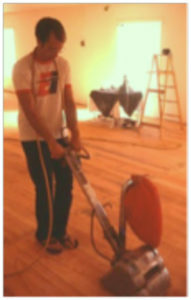 All activities were available to anyone who came, without qualification. The zendo was physically accommodating, with movable tans and room for chairs. * The environment was sustained by guidelines, rather than hard and fast rules. Financial support was voluntary; there was no financial obligation. 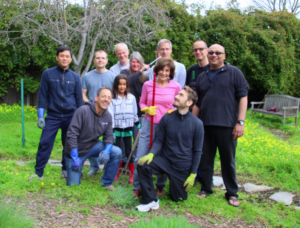 A pervasive atmosphere of giving and generosity was created by Marian, who prepared Saturday breakfasts for the Sangha and made frequent trips to San Francisco Zen Center to drive Suzuki-roshi or Katagiri-roshi to and from Haiku Zendo. Haiku Zendo was often filled to capacity. Frequently, people had to stand outside the zendo, unable to join in zazen. More room was required to meet the increasing demand. 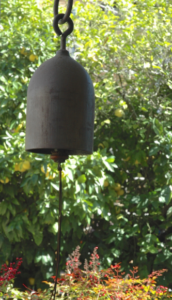 In 1968, Marian wanted to deepen her practice by leaving Los Altos to spend several years at Tassajara. She asked Les and Mary Kaye if they would move into her house and become stewards of Haiku Zendo. They agreed. Leaving their home in San Jose, they moved to Los Altos in September with their two children. 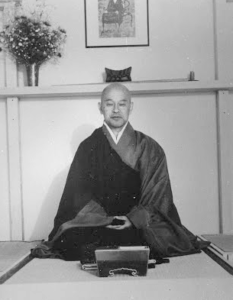 In 1970, encouraged by Suzuki-roshi, the students of Haiku Zendo invited the Zen monk Kobun Chino to come to Los Altos to be their spiritual leader. Chino-sensei had originally come from Japan in 1967 to assist Suzuki-roshi in San Francisco. In early 1971 he moved to Los Altos, and the practice flourished. 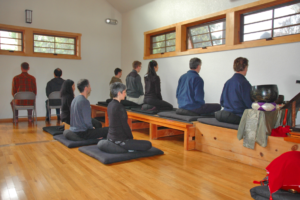 The gift-giving spirit of Haiku Zendo extended to the new Mountain View location. Sangha members extensively remodeled the church. They removed its theater type seats and linoleum floor tiles. They refurbished the underlying wood and moved a wall that separated the zendo and Sangha room to expand the size of the Sangha room. They replaced the floor-to-ceiling windows of the former church with clerestory windows, covered the clapboard exterior with stucco, and replaced the roof. The neighbors welcomed Kannon Do and its members, as it added a stabilizing influence in what was at that time a somewhat troubled neighborhood. In 1983, Kobun Chino-sensei appointed Les Kaye the spiritual leader of Kannon Do when he moved to New Mexico to assist in establishing a new Zen Center. In 1985, Les received Dharma Transmission from Hoitsu Suzuki-roshi, son and heir of Shunryu Suzuki, in a month-long ceremony at Rinso-in, the family’s home temple in Yaizu, Japan. In 1988, the Kannon Do Sangha invited Les to become its first abbot. 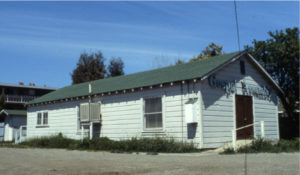 In 1990, the Kannon Do membership felt the need for a larger facility to accommodate its growing activities and to widen its accessibility to the larger community. Following ten years of fund-raising and three years of searching for suitable property in a tight real estate market, a half-acre property with two houses was purchased at 1972 Rock Street for $800,000. 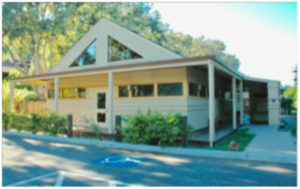 An additional year and a half was required to obtain the Conditional Use Permit from the city of Mountain View. Final plans for the new center were completed in 2004, construction took place in 2005, and the Sangha moved into the new Kannon Do in 2006. A formal dedication ceremony was held March 3, 2007. Today our membership has grown to nearly 400 members and has spawned new Zen Centers in California, Oregon, Maine, France, and Italy. Following traditional Zen practice, Kannon Do offers morning zazen, starting at 5:30 am, Monday through Saturday. (After zazen, a group of regulars meet at a local coffee shop for social time.) Weekly Dharma talks are presented Wednesday evenings. Saturday mornings include three periods of zazen, a potluck breakfast and weekly temple cleaning. Sesshins are held every other month. On-going activities include monthly “Introduction to Zen,” for visitors and beginners; “Meditation in Life,” quarterly group discussion for members and visitors to share stories and questions about the expression of practice in the workplace and with family; “:Buddhism in Society,” meetings and discussions with local social activists; and the Dharma school, based on the availability of children.